One of the key phases of any new home construction or home addition project is soliciting home construction bids from home building contractors. 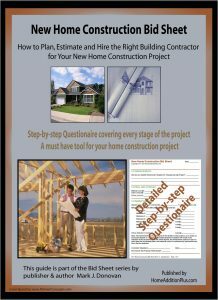 Obtaining home construction bids can be a difficult and confusing process however there are some steps you can take to make your life easier when it comes to evaluating construction bids. 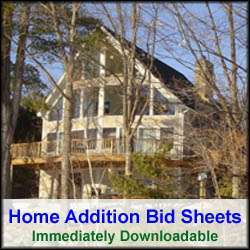 One of the best ways to get consistent and accurate home construction bids is to present each potential home building contractor with a complete set of blueprints or drawings to bid on. This way there should be nothing left to chance and the use of contractor allowances prevented. Home building contractors frequently use contractor allowances for items that are TBD. The use of contractor allowances never seem to work to the homeowners advantage, so do not accept home construction bids that include contractor allowances. Again, in an effort to avoid the use of contractor allowances, make sure you specify all of the finished items you want to see in your new home construction or home addition project. For example, make sure your plans and drawings include the specification of specific light fixtures, flooring material, bathroom fixtures, kitchen cabinets, etc. For large and complex home improvement projects such as new home construction, home construction bids should be itemized for each phase of the project. This way you can make apple-to-apple comparisons for each phase of the project. You can also see if anything has been left out in the construction bid. When obtaining home construction bids, make sure there is a detailed timeline with start and completion dates for each phase of the project. General statements of two months should be viewed as unacceptable. If they are truly going to complete the project in two months they should be able to document how. Every home construction bid should include copies of the home builder’s liability insurance policy and workman’s compensation papers. Avoid contractors who cannot provide these materials.